With the encampments and people parking themselves next to the kiosk its become a bit of a scramble and an unforeseen outcome. Problems with the LinkNYC kiosks. Firstly, I want to clarify that when I say “cheap” I’m not referring to using shoddy hardware or a free hosting service that could be unreliable. Your kiosk is going to be a reflection of your business, so the last thing you want to do is leave a bad impression with your customers because your kiosk is constantly out of commission. By cheap I mean affordable, because in order to do this on a tight budget you’re going to be selecting proven reliable hardware that’s not the latest and greatest on the market. Let’s start by examining the components which make up your typical kiosk solution. Most kiosks are either a freestanding design or else deigned to sit on a tabletop or be mounted to a wall. We’re going to use a tablet with a secure enclosure designed for a tabletop in this example because it’s a very economical and practical option. Craig Keefner put together this handy list of kiosk tablet enclosures. 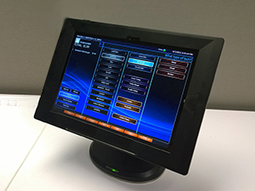 It’s important to select a tablet enclosure designed to handle the abuse of a self-service environment. This list is also a good starting point for selecting your tablet. There’s no point in selecting a tablet which no one builds a secure enclosure for. We’re going to go ahead and use the Microsoft Surface Pro 2 tablet because it’s a proven device running Windows 8.1. At the time of this writing the Surface Pro 3 has been out for a while so you can get the Surface Pro 2 for a good price. The list price is $899, but a quick search on Amazon shows that I can get a new one for $529.99. 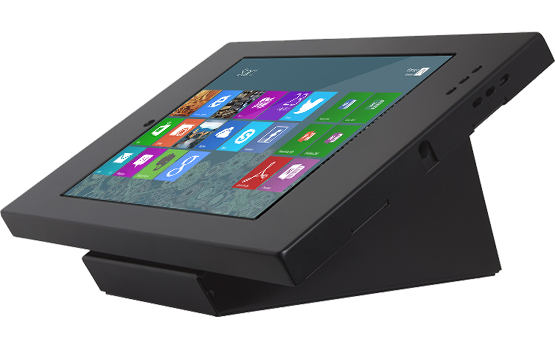 Next we need a tablet enclosure designed for a tabletop and secure enough for a self-service environment. We’re going to use the Full Metal Jacket + Figure 8 Base from ArmorActive which costs $289. The kiosk application is the software or website that makes up the user interface and potentially controls payment devices and other kiosk hardware. Your kiosk application can either be a native application or a website, but for the sake of doing this on the cheap we’re going to create our kiosk application as a website. One of the easiest ways to create your kiosk application is to use WordPress. Their CMS makes it really easy to create all of your own content without ever having to touch a line of code. You’ll also need a hosting solution. WordPress recommends a hosting company called Bluehost whose WordPress hosting starts at only $1.95 per month. Just signup for a WordPress hosting account and you’re ready to start designing your kiosk’s content in this easy-to-use CMS. The purpose of kiosk lockdown software is to ensure that your kiosk application (in this case a WordPress website) is always running and that malicious users can’t tamper with the OS. This kiosk software is essentially a security product which ensures that your content is always on the screen and your customer’s data is secure. Without kiosk lockdown software the kiosk can be hacked and your customer’s sensitive information could be compromised. KioskSimple is an economical kiosk lockdown software for Windows which costs only $149 per kiosk (one-time cost) and makes it easy to put your website on a kiosk. As you can see, putting together a self-service tablet kiosk solution can be very economically provided you select the right components and are willing to create the kiosk application yourself. If you get stuck, it’s not hard to find WordPress developers online for a reasonable rate. Your new tablet kiosk will allow you to serve more customers and even save on labor costs through the use of self-service. For your “cheap kiosk” remember for this example the cost is referenced to direct up-front costs, not subsequent costs. A service call is 2 hours of somebody’s time, usually at $60/hour. Computers which are End of Life are naturally cheaper, just like consumer models. The reason is odds are a year from now it won’t be available as a replacement. And instead of a Surface 3 for $500 you could use a $250 ASUS Transformer. Which one will need replacing first? For an Android kiosk there are multiple Android lockdowns. 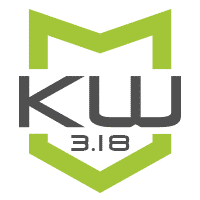 KioWare and Sitekiosk should be considered at the top. Both of these come with robust kiosk remote monitoring options. Then there is also Chrome Kiosks another option. It has the Chrome management console. Whatever people touch, people will eventually break. Figure on that and you should consider your keyboard (if used) and your touchscreen. Poorly mounted tablets which are banged around by people poking at them end up costing money. 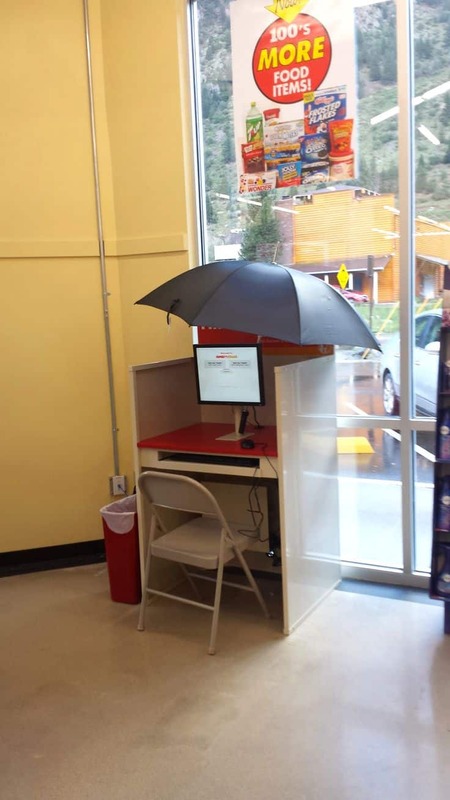 And remember DIY kiosks generally always appear to customers as DIY. Maybe that is a profitable strategy for some (dollar store e.g.). Below are some “not such a good idea” examples. And thanks to Andrew Savala of Redswimmer for the core article. Follow Craig’s board NOT the Best Idea… on Pinterest. As the deadline nears for U.S. EMV adoption, more processors are partnering up to help their clients speed through the certification process. “One focus of my group’s research is mimicking lung tissue, but the materials we work with, called hydrogels, have a broad range of biomedical applications including drug delivery systems and tissue engineering platforms to study a variety of diseases,” says Kloxin, who has joint appointments in the departments of Chemical and Biomolecular Engineering and Materials Science and Engineering. The kiosk is supported by a National Science Foundation (NSF) Faculty Early Career Development Award Kloxin received in 2013. Quite the store and very nice video tour by Retail Innovation and Craig Smith. Virtual inventory comes in all variations. Google plans to release a new mobile payment system called Android Pay, which will include many of the same features as Apple Pay, while the Google Wallet brand will live on as a peer to peer service. Interesting to that they have chosen to support fingerprint recognition for biometric payment method. Calling it “Android Pay” hitches a ride with Apple Pay for sure. According to a new market research report “Digital Signage Market by Type (Hardware (Displays, Media players, Projectors), Software, Services (Installation & Maintenance)), by Application (Commercial, Infrastructural, Institutional, Industrial) & Geography – Global forecast to 2020”, the total digital signage market is expected to reach $23.76 Billion by 2020, at a CAGR of 8.18% between 2015 and 2020. This is the usual Markets & Markets report this time for digitial signage. According to M&M — The major players in the global digital signage market are NEC Display Solutions (Japan), Samsung Electronics Co. Ltd. (South Korea), LG Display Co., Ltd. (South Korea), Sharp Corporation (Japan), Sony Corporation (Japan), Panasonic Corporation (Japan), AU Optronics Corp. (Taiwan. ), Planar Systems, Inc. (U.S.), Adflow Networks (Canada), and Omnivex Corporation (Canada). The major players in the global digital signage market are NEC Display Solutions (Japan), Samsung Electronics Co. Ltd. (South Korea), LG Display Co., Ltd. (South Korea), Sharp Corporation (Japan), Sony Corporation (Japan), Panasonic Corporation (Japan), AU Optronics Corp. (Taiwan. ), Planar Systems, Inc. (U.S.), Adflow Networks (Canada), and Omnivex Corporation (Canada). Company will demonstrate its next-generation consumer retail health software with back-end integration enabled by Xerox at ATA 2015. The 2.0 software upgrade leverages Xerox’s healthcare IT infrastructure to seamlessly interface with insurance claims through a payment data feed and integrates with electronic medical records (EMRs) for continuity of care. The back-end integration with the Xerox infrastructure enables a secure, cloud-based environment that is scalable to and delivers consistent performance. During his tenure as CEO since 2005, Bill Nuti had moved NCR Corporation (originally National Cash Register) from its historical competence in hardware to become a provider of hardware and software for managing transactions across a range of industries and payments methods. Nuti envisioned a world in which consumers would use NCR hardware or applications whether transacting at a bank or ATM, purchasing clothes at a retailer, or checking into a flight at an airport—and in which NCR software would register the transactions, securely store and process the data, and use the transaction information to help NCR customers efficiently manage their operations. In 2011 and early 2013, NCR had made two major acquisitions of companies that were important providers of transaction software in the retail and hospitality industries. Now, in late November 2013, Nuti and his team were considering a third potential major acquisition: Digital Insight, a market leader in online and mobile banking solutions. Nuti saw Digital Insight as key to complementing NCR’s offerings in the financial services industry, transforming it from a maker of standalone, electromechanical cash registers and ATMs into an “omni-channel, omni-commerce, software-driven company.” Would this acquisition be the next right strategic move for NCR’s transformation? Move over, Seattle and New York. Philly may not be a first-gen adopter, but I’m proud to say my city’s pay-t0-ride biking service is already a smash hit, with over 8,000 rides and 2,400 new members in its first week alone. Preview of NRA offerings Nextep will feature such as tablet kiosks on Surface3 as well as Outdoor Drive-Thru kiosks. Good stuff! If you’re short on space or just want a sleeker look on your desktop, then you need an all-in-one desktop. Here are our highest-rated performers.